2 bedrooms, 2 bathrooms, living room, kitchen/dining, patio. MW, DW, W/D, Cable TV, WiFi/DSL. POOL PRIVILEGES @ DAYS INN. BEDS: 1 King, 2 Single, sofa bed. Accommodates 6. NO PETS, NO SMOKING. The property is in an excellent location, but in our down time we could have enjoyed our stay more if the furniture in the living room was upgraded. A full size couch and one recliner would have been awesome. Just some updates to curtains, etc. would be nice. We did, however, enjoy our stay, and I highly recommend Jekyll Realty. It was a great place. Needed a few improvements but over all very nice. Nice. The outdoor furniture was shaky. Need grilling tools. Arrived home from our 3rd time in Jekyll, first time renting at Atlantic Breeze. We would not hesitate to stay again and would recommend it to friends. The unit is dated in decor and furnishings, except for the appliances, but it was clean and comfortably spacious. The beds were great and there were extra pillows and blankets. We did not use the pull-out sofa, so I cannot comment on that. During our time, the internet and sometimes Tv would go out for several hours at a time. We learned quickly that this was an island-wide issue, so nothing could have been done. It just meant more down/ reading time, as the weather was rather unsettled during our stay. We were thrilled to be visited by neighborhood deer with their fawns and enjoyed and anticipated their visits every day. We had a ground floor unit, and the outdoor seating was appreciated especially on those rainy days. We were also very happy to have the beach so close by. The beach is wide with hard packed sand and warm water.....accessible at low tide. We cooked in most days and found nothing lacking for food prep in the kitchen. The bathroom and main bath taps need some maintenance, but there was always hot water with good pressure. WE enjoyed the new beach shops, bike riding, Ghost tour, Historical area. Because of the weather, we did not get to use our pool pass at the Days Inn.....but there is always next time. We know we will be back ! Thanks for this opportunity ! It is always s pleasure dealing with Jekyll Realty. The properties are clean and the people are great. This apartment was spacious and the location was great. Would highly recommend this rental unit. Jekyll realty always delivers. If there is ever a problem, they respond promptly. We had a problem with our tv and even though it was after hours. We had a person there within 30 minutes who solved the problem. They always take care of any problems. We were happy with our stay--disappointed about the change in pool passes. The furniture is a bit dated in the unit, but we loved the location. We have stayed with Jekyll Realty for over 20 years. We like this apartment the best. It is very roomy, quiet and always in good shape. The furniture in the living room needs to be replaced with something that will support your back. Thatis about the only complaint I have. 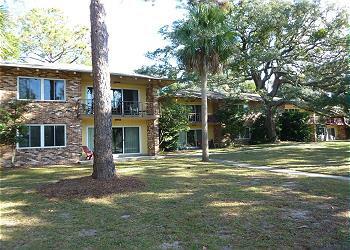 The accommodations were dated but reasonably priced, comfortable,quiet and convenient to the beach. Worth staying there. we enjoyed our stay. The units 3 and 4 which we always rent together are in a very good location. The staff was friendly and courteous and the maintenance did a superb job fixing a refrig and a kitchen table that were broken when we checked in expediently. Thank you The dryers worked but took way too long to dry clothes especially towels. We have been staying at these units since the late eighties . The units are roomy . The new digital locks on the doors were very convenient. The units have always been too dark ..lamps do not provide enough light especially in the bedrooms. I usually bring extra lighting but it would be nice not to have to pack them. WE have reservations again for next year. we enjoy staying here and in all the years we have stayed have not had a major issue or one that was not taken care of quickly.